I’ve always wanted to own a little neighborhood bar and grill. You know….the kind of place where everyone knows your name…. Seriously though…it would be nice to have a place with great atmosphere to share good food and beverages with friends, but I’ll probably never have my own place. Why invent the wheel when the Atlanta area has SO many great places to enjoy? I love to try new places, but one tavern with a neighborhood feel keeps drawing me back time and time again, and I’m fairly certain that if I owned a place it would be very similar to Marlow's Tavern. The décor is simple with dark woods and walls filled with black and white prints in simple frames of all sizes. 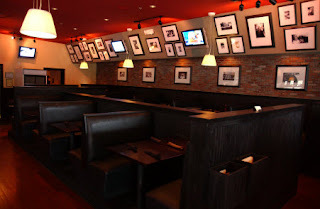 Booths, tables for two, and high-tops for large groups fill the dining room along with a bar that begs for your company. Along the back of the Vinings location – my regular haunt though I have ventured into the Kennesaw location, too – is an open kitchen where you can see the staff in an orchestrated frenzy as they prepare your meal. As bar food goes Marlow’s is the top….I’ve tried the Truffled Pamesan Fries and the Asparagus Fries with Citrus Aioli. 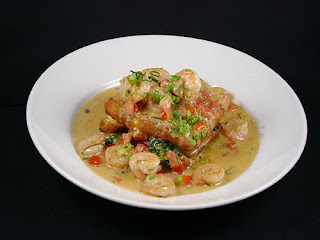 My husband enjoys the Grilled Atlantic Salmon while one of my personal favorites is the Shrimp and Grits….a white cheddar grit cake with spinach, tomato shallot and sauce Beurre Blanc. As far as drinks go they have all the usual drinks, but I tend to go with many of the more unsual offerings such as the BLT Blood Mary featuring house made bacon vodka with caraway and thyme infused spiced tomato juice or the Grapefruit Ricky with Smirnoff vodka, grapefruit juice, lime juice, St. Germaine and fresh grapefruit. The other night I tried the Cream Soda which was a tried and true cream soda mixed with vanilla flavored vodka. Yum……. 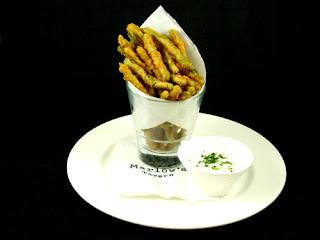 My husband and I have stopped by Marlow’s for dinner at the normal dinner hour as well as dinner on a Saturday night as late as 11 p.m. We’ve stopped in for a drink or two on our way home from various events. In fact, our family ended up there last year for my Mother’s Day brunch when our first choice proved to be a little too busy. The Vinings location has live entertainment Wednesday through Sunday….and the patio is now open. Their full menu is always available until closing….Sunday through Thursday until midnight and Friday through Saturday until 2 a.m.